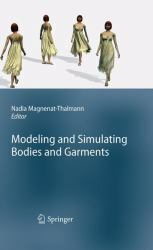 Modeling and Simulating Bodies and Garments is a comprehensive visual textbook, dealing with all aspects of 3D virtual clothing and allowing users to try on virtual outfits. It covers a number of topics including: - Body modeling and animation - Character based adaptation - Cloth modeling and simulation - Design and animation of patterns and clothes - Virtual prototyping The chapters cover the complex issues that have to be addressed in order to successfully implement a 3D virtual try-on, discussing the adjustments that have to be made to calibrate the dimensions, the effects of motion, and cloth retargeting. The ultimate goal is for humans to see themselves at any time, wearing any clothing available in the database, adapted to their body size. Students and practitioners alike will benefit from the information contained in the book. Many images are included, and more can be found on www.miralab.ch. Professor Nadia Magnenat-Thalmann is currently Professor at the University of Geneva in Switzerland and Director of the research lab MIRALab. After having obtained several diplomas in various disciplines (Psychology, Biology, Chemistry, Computer Science and a PhD in Quantum Physics, all from University of Geneva), she moved to Canada in 1977 where she became subsequently assistant, associate and full Professor at the University of Montreal. During these years, she pioneered the field of Virtual Humans and received 7 artistic awards for her participation to the film "Dreamflight". This film won an award at the conference On-Line in London, in front of Disney's film "Tron" in 1982. She further developed a strong agenda of interdisciplinary research that was considered by the scientific community as a very early innovation. In 1987, she was nominated Woman of the Year by the greater Montreal Association for her exceptional achievement in Sciences and Art. In 1988, she received a one year grant from the Council of Arts of Canada for her co-direction of the film "Rendez-vous in Montreal" that allows her to show her work on Virtual Marilyn at the Modern Art Museum in New York along with young Canadian promising artists. Back in Switzerland in 1988, she has initiated and developed several programs of intensive research that have been awarded by the European Commission and the Swiss National Foundation. She has obtained more than 45 European projects that makes her group the most EU funded lab in Switzerland. During the nineties and 2000, she has received continuously scientific and artistic awards. Among the most cited awards are the Golden Camera Award at the Golden Camera Ceremony in Berlin (shown at TV with 16 million viewers), a ZDF program dedicated to "die virtuelle Marilyn, die Welt von Nadia Thalmann", more recently her selection in the electronic Wall of Fame in the Heinz Nixdorf Museum in Germany and the best paper of the International Journal of Virtual Reality for the year 2007 (award obtained by vote of the readers). She is regularly invited by the European Commission to contribute to the writing of white papers, particularly for the Networked Media Unit dealing with the 3D internet as she is coordinating a Network of excellence in Network Virtual Realities (intermedia.miralab.ch). She recently directed the research and the production of a new awarded film, High Fashion in Equations, that was shown at the Museum of Yverdon and at the electronic theatre in SIGGRAPH 2007, film selected among 1000 submissions, most of them from Disney, Pixar and DreamWorks and other major production houses. The film has received since then two artistic awards in 2007 and 2008. Professor Nadia Magnenat-Thalmann has contributed, along with her students, to the publication of more than 480 scientific papers, written more than 40 books and produced more than 25 virtual reality interactive shows. Professor Nadia Magnenat-Thalmann is Editor-in-chief of several scientific journals, among them, the Visual Computer published by Springer and the Computer Animation Virtual Worlds Journal published by Wiley. She is also associate Editor of several others, as for example, the IEEE Transactions Journal on Multimedia. She has been invited to present and discuss the impact of her work at the World Economic Forum in Davos from 1999 to 2001.